Amazon has their fingers in a lot of pies, including selling new and used textbooks, selling and renting digital textbooks, and even buying back textbooks from students. This has put them into competition with quite a few companies, including everyone from B&N to half.com to Coursesmart. 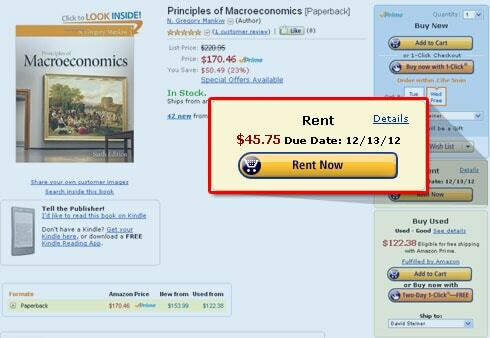 In fact, Amazon does virtually everything with textbooks except rent them. Today that changes. I've just gotten an unconfirmed report that Amazon is renting paper textbooks. There hasn't been any official announcement from Amazon (and I'm still waiting for confirmation) but it does look like Amazon is ideed renting paper textbooks. There's already a support page with an FAQ and instructions, and at least one textbook has a rent button (or had a button at one point). If you check your calendar, you can see that this is a full semester rental. Unlike the Kindle rentals, it doesn't look like Amazon is offering shorter periods than a full semester, but they do have an optional 15 day extension. Shipping is free if you have an Amazon Prime or Amazon Student membership. The program is only available to US residents, of course, but if this textbook is any indication then it is a decent deal. Amazon doesn't have this title as a Kindle textbook, so it's not possible to compare the sale or rental price directly. But for other titles it does look like Amazon's rental prices for paper are significantly better than for comparable Kindle textbook rentals, which are set by the respective publishers. That just goes to show that a free market tends to set a lower price than a monopolist might like. You can find this title at Chegg , where it is renting for $58, and on half.com you can find it for around $60 (for a 125 day rental). Speaking of which, half.com has been running a textbook rental marketplace for at least 6 months (that I know of). If you're looking to rent, I'd go there first because like the textbook sellers the rental services have to compete. Textbooks seem to be on Amazon's mind this fall. I've been told that they're making a stronger push to offer more Kindle titles, both for sale and rent, and that they've started pushing harder on textbooks in general. This is not good news for publishers, but the extra competition is a very good thing for students.